Finnair’s operational result fell by EUR10 million in 2Q2013 compared with the same period of 2012. Moreover, the carrier lowered its full year revenue outlook from expected growth to “approximately at the 2012 level”, due to the weak Japanese yen. Nevertheless, there are also some more positive signs for new CEO Pekka Vauramo, who joined on 3-Jun-2013. First, without the impact of its fuel hedging programme, Finnair's operational result would have improved by EUR12 million. Second, its strategic focus on carrying passengers between Europe and Asia was reflected in strong traffic growth and market share gains in these two regions. Third, Finnair’s cost reduction programme reached its EUR140 million savings target six months ahead of schedule and the company remains committed to achieving a further EUR60 million in savings by 2014, mainly through labour productivity improvements. Finnair saw its operational result fall by 62% to EUR6 million in 2Q2013 (EUR16 million in 2Q2012), in spite of a 2.7% increase in revenues to EUR610 million. The net result was a profit of EUR17 million, versus a loss of EUR19 million in the same quarter last year, reflecting a gain on the sale of Finnair’s 4.7% holding in Norwegian Air Shuttle and non-operating items such as fair value changes. In the quarter, Finnair saw passenger numbers grow by 6.3% with capacity (ASKs) up 5.6% and passenger load factor up 0.7 ppts to 78.2%. The load factor gain did not quite match that of the Association of European Airlines average, which saw a gain of 1.2 ppts to reach 78.7%. Finnair’s unit revenue (RASK) fell by 3.1% year on year (-1.7% excluding the impact of foreign exchange rate movements), while its unit costs (CASK) fell by only 0.7%. While RASK weakness owed much to the decline in the yen against the euro, it also reflects a soft pricing environment due to economic uncertainty and price-based competition. Finnair enjoyed the strongest passenger traffic growth on its European and Asian networks. In Europe, RPKs were up by 9.7%, although load factor dipped by 0.5 ppts, and in Asia, RPKs were up 6.6% and load factor improved by 1.9 ppts. Nevertheless, traffic revenue grew by only 4% in Europe and fell by 1.1% in Asia. Revenues in Asia were adversely affected by the weakening of the Japanese yen against the euro. According to Finnair, total passenger numbers in the market between Helsinki and its European destinations grew by 4.6%, while the market between Finnair’s Asian and European destinations fell by 2.1%. Its share of passenger numbers on its Asian routes increased from 4.8% to 5.9% and its market share on its European routes increased from 47.8% to 49.4% (excluding Flybe-operated contract flying). Its Asian growth strategy saw new routes to Xi'an in China and Hanoi in Vietnam in the summer 2013 schedule. Market demand for air cargo between Asia and Europe was largely unchanged and this was reflected in Finnair’s cargo traffic result (RTK +0.2%). Finnair’s operating costs increased by 4.0% year on year in 2Q2013, faster than the growth in revenues, but slower than the growth in capacity. Expenditure on the biggest cost item, fuel, grew by 8.6% in spite of a reduction in fuel prices. This was mainly due to the impact of Finnair’s fuel hedging programme, which yielded a gain of EUR18 million in 2Q2012, but a loss of EUR4 million in 2Q2013. Without this adverse year on year swing of EUR22 million from fuel hedging, Finnair’s operational result would have increased. Excluding fuel, costs were up 2.3%, just less than the growth in revenues. Staff costs, the second biggest item, fell by 10.6%. On a six month basis, staff costs fell 10.3% and average headcount fell 16.4%. Increases in catering and maintenance costs partly reflect outsourcing and the reduction in personnel costs. Unit costs fell by 0.7%, or by 2.4% excluding fuel. As noted above, outsourcing helped to lower unit personnel costs, but to increase unit costs in maintenance and catering. Finnair’s cost reduction programme, launched in Aug-2011, has achieved its savings target of EUR140 million six months ahead of the original schedule. Through outsourcing and other cost reduction measures, Finnair has been able to shift a number of fixed costs to variable costs. Further savings are now being pursued and Finnair’s long term objective is to achieve an operating margin of 6%. A supplementary target of EUR60 million of savings by the end of 2014, in addition to the EUR140 million now achieved, was set in Oct-2012. Savings in two of the biggest targeted areas, maintenance and personnel, are behind their original targets and are the main focus for further reductions. According to Finnair CEO Pekka Vauramo, “Part of the supplementary cost-reduction target can be achieved by streamlining operations, but accomplishing the target in full will require an improvement in labour productivity. We must now find, in a dialogue with personnel, solutions and the will to make changes” He aims to achieve this through changes not only in wage structures, but also in working hours. Finnair’s Airline Business is its largest segment, accounting for 91% of group turnover in 2Q2013, and also its most profitable. The other two segments, Aviation Services and Travel Services, made operating losses in the quarter. The Airline Business segment turned around an operating loss of EUR7 million in 2Q2012 to a profit of EUR11 million in 2Q2013, with revenues up 3.2%, broadly reflecting the progress of group revenues. The geographical performance of traffic and revenues is note above. Business travel was soft due to the economic environment in the euro area and Finnair’s corporate sales were flat year on year. Finnair’s leisure traffic (charter flights) saw capacity (ASK) fall by 1.5% and traffic volume (RPK) remain flat year on year. The average number of employees in the segment was virtually flat year on year. The increase in passenger traffic reflects some improvement in labour productivity. The Travel Services segment recorded a small operating loss (-EUR1 million) in 2Q2013 after a breakeven result (EUR0.5 million) in the same quarter last year. The segment consists of tour operators for leisure travellers, business travel agencies and travel sector software. Revenues fell by 2.1%, affected by economic uncertainty and fair weather in Finland. The operating result also included non-recurring costs related to the closure of the office network of Finland Travel Bureau, a business travel agency. The Aviation Services segment widened its operating loss from EUR10 million last year to EUR22 million in 2Q2013, with revenues falling by 33.8%. The loss was mainly a result of non-recurring restructuring costs. The segment consists of maintenance, catering and travel retail activities in addition to Finnair’s property and office services. The operations of Finnair Catering Oy were transferred to LSG Skychefs on 1-Aug-2012 and engine and equipment maintenance were outsourced in Jul-2012. The majority of the group’s headcount reductions came from the Aviation Serves division, reflecting the outsourcing in maintenance and catering. Finnair operated a fleet of 44 aircraft at the end of Jun-2013 and owned a further 25 aircraft that were operated by other airlines (mainly Flybe Nordic). This compares with 45 operated by Finnair and a further 24 operated by other airlines at the end of 2012. The average age of the Finnair-operated aircraft was 10.3 years at the end of Jun-2013. The first three of five Airbus A321 aircraft that are on order to replace ageing 757s are due to be delivered in 2H2013 and the remaining two will be delivered in 1H2014. This will give it an all-Airbus fleet (with the exception of regional aircraft). Finnair ordered 11 A350 aircraft (and eight options) in 2005 and it expects the first delivery in 2H2015, which should make it the first European carrier to receive the new Airbus wide-body. At the start of Jul-2013, Finnair joined the oneworld ATI-immunised transatlantic joint venture of American Airlines and IAG subsidiaries British Airways and Iberia. It also announced plans to join BA and JAL in their JV between Europe and Japan, subject to regulatory approval. British Airways and JAL entered into a joint business arrangement in Oct-2012. Finnair operates daily from Helsinki to Tokyo, Osaka and Nagoya, while British Airways operates from Heathrow to Tokyo Narita and Haneda airports. Japan Airlines daily operates from Tokyo's Narita and Haneda airports to London and Paris as well as from Tokyo Narita to Frankfurt. Japan Airlines launched new daily non-stop service between Tokyo Narita and Helsinki from 01-Jul-2013. Japan is a much more important market to Finnair than is the US and so the BA/JAL joint venture is potentially more important to it than the trans-Atlantic AA/BA/IB JV. Finnair’s outlook for 2013 now sees revenues “approximately at the 2012 level due to the pressure that the weak yen puts on the Japan generated unit revenues”. Previously, it had anticipated that revenues would grow. It still expects unit costs ex fuel to fall compared with 2012 and fuel costs to remain high. As before, it refers to the “uncertain economic outlook in Europe, weakened consumer demand and slower growth in Asia”. Finnair continues to expect a positive operational result for the year, but, with a lower revenue outlook, this result is likely to be lower than previously hoped. Finnair’s vision is to be the top airline in the Nordic region and the most desired option for travel between Asia and Europe. 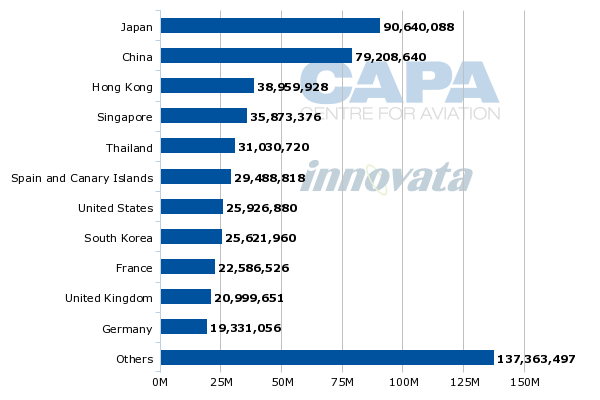 It currently ranks number three (behind SAS and Norwegian) in total seat capacity in the Nordic region and number eleven between Asia Pacific and Europe (it is the number five airline group between Western Europe and North East Asia). It also aims to double revenue from Asian traffic from 2010 to 2020. See related report: Finnair, SAS and Norwegian, The Nordic Three: is consolidation on the way? While Finnair's demand-side aims demonstrate ambition and a determination to growth traffic and revenues, the experience of its 2Q2013 results shows that pricing is not always something that management can control. Its new CEO's continued focus on cost reduction will be paramount. See related report: Finnair: what a new CEO should know before joining. Cost reductions "absolutely necessary"